Make the most out of your stay at Banff Sunshine, the only ski-in, ski-out hotel in Banff National Park. Experience champagne snow, the Verde Day Spa, mountain tours and more. Make Memories, one thrill at a time. Book your stay at the Sunshine Mountain Lodge and make memories to last a lifetime. With our ski and stay packages, you can choose the lift and accommodation deals that fit your needs. Book a lesson, take a guided tour, explore all three of our mountains, and pick a different restaurant to dine at each day. 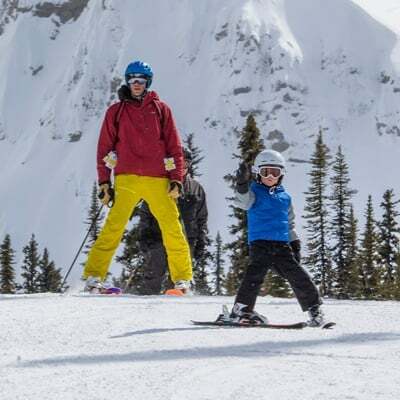 Upgrade your ski vacation and stay at 7,200 ft in the heart of the Canadian Rockies. Book your stay at The Sunshine Mountain Lodge, Banff's only ski-in, ski-out boutique hotel. Add your Banff Sunshine Village lift ticket to your stay and save. Your day pass gets you over 3500 acres of mountain terrain to explore. Need skis, snowboards, boots, poles, jackets, snow pants, or helmets? No matter your skill level, our high-performance demo tent and rental shop have gear options for you. You can book your rental packages for one day or the length of your stay. Take your skiing or snowboarding to new heights. Sign up for a complimentary guided tour, or book a lesson with one of the pros from our Sunshine Ski and Snowboard School. Join us for breakfast, lunch and dinner at one of our many Village eateries – including 3 located right in the Sunshine Mountain Lodge. Join us for après-ski fun and enjoy our nightly hotel activities.